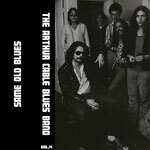 Lost recordings of The Arthur Cable Blues band from 1975, recorded live to four-track cassette in Massachusetts. Along with new solo acoustic recordings engineered by Wylie Cable, Arthur's son, in 2012. This tape from Dome of Doom Records comes with no track list, just the way I like it and it is super funky and mello. These are the kind of blues your daddy grew up on and the songs on here will definitely make you want to vibe and keep cool.